Plus we try out a meal powder that cuts out the need to prepare (or chew) your own food. WATER, POWDER AND… that’s it. English internet entrepreneur named Julian Hearn had the idea to create a nutritious form of powdered food after getting frustrated about the amount of food prep eating healthily involved. And so in 2015, Huel was born: a powdered shake that claims to contain all you need for “a perfectly balanced and nutritionally complete meal” while also taking just two minutes to make. Of course, the powder isn’t the first – or the most extreme – of the liquid food products on the market. Soylent was rolled out for mainstream delivery in 2014, and it’s the original meal-in-a-bottle, a soy-based drink that you can even buy pre-mixed if you wish. But could liquid or powdered meals really be the breakfast, lunch, dinner and snack of the future – or would we miss the act of chewing our food, looking at our food and photographing our food too much to give it up completely? Future Stories is a monthly podcast from TheJournal.ie and Volkswagen. In the latest episode, we’re looking ahead to what mealtimes could look like in the coming decades, as food sustainability becomes a growing concern and scientific advances change how we look at nutrition and diet. In this month’s episode, Tracy Tough heads to The Fumbally in Dublin to hear about the growing field of psychobiotics and gut health from the cafe’s co-owner Aisling Rogerson, who’s planning a full workshop dedicated to the topic on October 20. Psychobiotics is a term coined by scientists at APC Microbiome Ireland in UCC to describe live bacteria that, when eaten, can have a direct effect on our mood and cognition. Tracy also samples a lunchtime dose of Huel for herself, speaks to the company’s co-founder James Collier, and dials up Denmark to hear from with Koert van Mensvoort of Bistro In Vitro. If you’ve ever wondered whether a lab-grown burger could taste like the real thing, Bistro In Vitro might have the answer. Right now, the restaurant is a digital concept only, a website with menus for outlandish starters, mains and desserts like in vitro oysters, cultured chicken and knitted steak. There’s even a virtual booking system, where users can choose their dishes and reserve a table for 2028. Van Mensvoort’s restaurant has no bricks-and-mortar equivalent just yet, but he has given the dishes on his menu a star rating, with the five-star dishes closest to being produced in a real-world restaurant. The two current five-star plates on the Bistro In Vitro menu are Lab Pearls and Magic Meatballs, both made from cultured meat. Other, more ethically questionable, dishes like Celebrity Cubes (a “deliciously addictive dish… made from celebrities’ stem cells”) thankfully have a far lower rating for now. Email “Swap your takeaway for a test-tube burger: Hear about the future of your dinner in our latest podcast”. 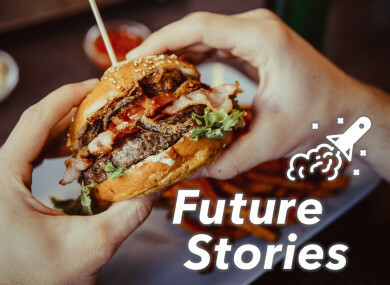 Feedback on “Swap your takeaway for a test-tube burger: Hear about the future of your dinner in our latest podcast”.